Mental Health and More...: Resiliency in Nature--As Explained by Bear Grylls? Resiliency in Nature--As Explained by Bear Grylls? The following is an article I wrote a few years ago. It has some humor to it, because it is supposed to. I find that there are principles of psychological survival in day-to-day activities. Feel free to read and respond. In searching for psychological and behavioral examples of how to develop resiliency, one can encounter natural examples and some that are made into entertainment. An example of survival resiliency is displayed on Man vs. Wild with Bear Grylls. It is a television show aired on the Discovery channel that focuses on Mr. Grylls’ survival techniques in various climates and environments throughout the world. He is left in a wilderness area and has five days to get out of danger, survive, and find people or civilization. He has with him only his clothes, his canteen of water, a flint, and a knife. In one incident, he was dropped in the outback of Australia during the rainy season. Although rainy, the environment is harsh, dry, and hot. There aren’t many water sources for miles. The weather was roughly 110-120 degrees Fahrenheit with 100% humidity that increases the perceived temperature by about 10 degrees. After walking for several miles he was out of water. Before running out of water he mentioned that with the humidity and the heat it was important for him to keep his head cool, therefore, he had to cover it with something to absorb his perspiration. The camera cut for a moment and it showed him with his boxer shorts on his head. He said that it is vital to be willing to do what it takes and be open to any opportunity to survive, including using your boxer shorts on your own head. After running out of water he searched for more, but could find none. Therefore, he resorted to urinating in his canteen. He said that it is not poisonous and can be consumed as it is 95% water. Again, you must be willing to take hold of any situation or opportunity to survive. He also, in all of his shows, continues moving without stopping. His goal is to reach people or civilization. Therefore, he is constantly moving. As he is walking he finds things to eat along the way. He is familiar with the terrain and with what is edible and useable. When he gets wet, he immediately seeks shelter, tinder, and wood for a fire to dry off. As he was in Australia he spoke about the aborigines that are native to the land. He mentioned that they are ultimate survival experts. They live by the land. They treat it as an organism and an entity separate from everything else. They use what the environment “gives,” “provides,” or “offers” them. If it provides water they drink and load up. If it doesn’t, they find ways to stay hydrated through other means. If they’re hungry, they eat what is offered and they use it all. As Bear was walking he came across a spider that is edible. He ate it. He came across a snake at one point as he was preparing to sleep for the night. He killed it, cooked it, and ate it. He said that the aboriginals adapt to the environment and the situation it presents. They are positive thinkers. He mentioned that in order to survive you must find small positive aspects of the environment that bring joy and relief, even if momentary and fleeting. At one point in the Ecuadorian jungle he came across a single purple flower hanging from a green vine. He stopped to enjoy it and stated that nature could not help but to just place a single flower and that he was probably the only person that would ever see and enjoy that flower for the beauty that it was. Another aspect of survival is knowing your strengths, limits, and the dangers. 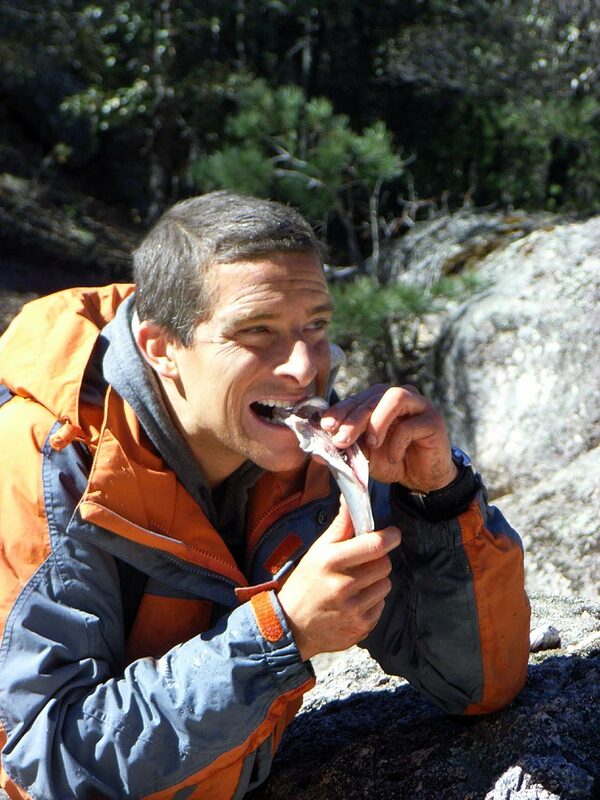 Bear Grylls is athletic, strong, and in good physical and emotional shape. However, at times even he has to turn back and find another route. At times even his ideas and plans fail. He mentions that it is part of the survival journey–plans will fail, but you must remain positive, keep your head and not panic (Donahue & MacIver, 2006). (I don't have the references on here. If you want them, let me know). Good article. Bear has had a lot of criticism in the past for staging his situations too much for entertainment. Gotta admit that I'm still entertained by him. In regards to your post, I think the main reason many are drawn to him is because of his enthusiasm to move and keep trying new things. Just like a kid. I agree. Bear has had a lot of criticism in the past for staging situations. I do find them entertaining, though. I have also watched other shows similar to his and found them equally as interesting, but his has an entertaining flare that the others don't. I do enjoy the enthusiasm, as well. Some of the principles seem to be sound.